Free pizza for a year? Yep, there’s plenty of fun to be had and even more pizza to be eaten at the second annual Great Rustica Race happening Tuesday, May 24, 2016, from 6-10 p.m. In celebration of National Scavenger Hunt Day! Teams of two will storm the streets of downtown Chandler collecting scavenger hunt items at participating locations for the chance to win free pizzas for a year and gift cards galore. With only a few days left, eager racers are encouraged to call or stop by Crust Chandler to register asap. Presented by Downtown Chandler Community Partnership, participating merchants include Burst of Butterflies, ChopShop, Crowne Plaza San Marcos, Crust Chandler, Murphy’s Law, My Choice Insurance, Paletas Betty, Sabas Western, SanTan Brewing, SoHo63, TechShop, Vintage 95 and Wimpy’s Paradise. The Great Rustica Race check-in starts at 6 p.m. at Crust Chandler, 10 N San Marcos Pl, Chandler, AZ 85225. There teams will receive a scavenger hunt game piece and have their start time recorded. Once they find all items on their scavenger hunt list, teams will return to Crust Chandler and have their end time recorded. The top three teams with the shortest cumulative time will win prizes. The lucky first place winners will receive free Rustica pizzas for a year from Crust Chandler. Gift cards from Crust Chandler and other participating merchants will be awarded to second and third place champions. After the race, Crust Chandler will host a post-race party downstairs at the Ostrich, which includes complimentary pizza and soft drinks from 8-10 p.m. 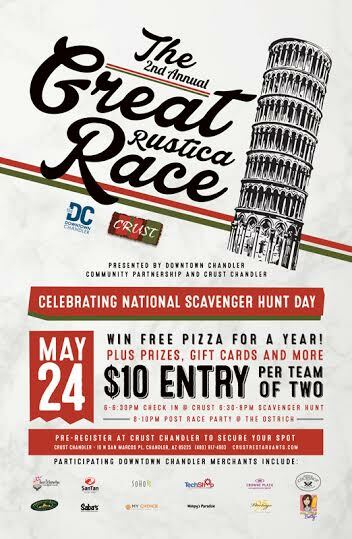 Registration to participate in the Great Rustica Race is $10 per team, with sign-ups located at Crust Chandler, 10 N San Marcos Pl, Chandler, AZ 85225. $5 raffle tickets are also available to win merchandise/gift cards donated by local merchants. Space is limited and registration will be handled on a first come, first served basis. All of the proceeds from the raffle will benefit Kurt Warner’s Treasure House Foundation. For more information, visit: http://crustrestaurants.com. Armed with a solid list of family recipes, New York style ambition, and a passion for making deliciously authentic Italian food; Mike Merendino opened the first Crust location in 2007. Located in Scottsdale at the corner of Hayden & Indian Bend Road, Crust offers Arizonians the best east coast classic Italian cuisine. The comfortable and friendly neighborhood vibe is described as Simply Italian. By serving authentic family recipes, the true spirit of tradition and the love of Italian food and culture are served one dish at a time. Today, Crust Restaurants include three full service locations in Scottsdale, Phoenix and Chandler. Crust Restaurants also operates a satellite location in the Phoenix Convention Center as well as a sister concept, My Pie – with two locations in Phoenix and Tempe. Visit Crust online at www.CrustRestaurants.com for more information and to view their complete menu. Treasure House is a supported living community for young adults with intellectual and developmental disabilities. It is the vision of Kurt and Brenda Warner, who believe all people should be provided with appropriate resources and opportunities to participate in meaningful and challenging activities, establish personal relationships, and contribute to their communities. The first Treasure House community will open in Glendale, Arizona in 2016 as an affordable, replicable model. It will feature individual studio apartment units for 24 residents and 6 community assistants, along with shared common areas such as a large community kitchen, living room, and recreational spaces. This residential living community will provide opportunities to cultivate independence and self-advocacy through employment, education, and community service. For more information, please visit Treasure House online at www.treasurehouse.org. ← Previous Previous post: Check Stingray’s Honey Dew List Off Your List at Home This Memorial Day! Next → Next post: Hard Root Beer Showdown: Who Will Float to the Top?